Amazing footage in Cornwall. My eyes are looking on the tail end of the trough heading up. Seems to be some recent strikes near the Channel Islands. Radar return near Merthyr south wales. Expect popcorn cells now to fire off as things destablise. Is it me or does it look like the storm is moving North East on the Real Time Lightning website? Anyone know why Plymouth got it so fierce? looks like it was a fake return? I've just popped outside for a smoke, the skies are relatively clear with some mid-level cloud floating in, and to my southwest, I can see lightning. I was wondering whether you'd see anything from there. Fingers crossed. Tomorrow still looking good for those further N and NE as Saturday progresses. I'm off to bed. As much as I love it I can't bear to see more lightning and know I could have been there watching it... have fun all those in the path! Interesting. Could be something here later on if that's right. Insane storm , jealous .. absolutely !!!! I'm off to sleep in the back yard, hoping the thunder will wake me up! 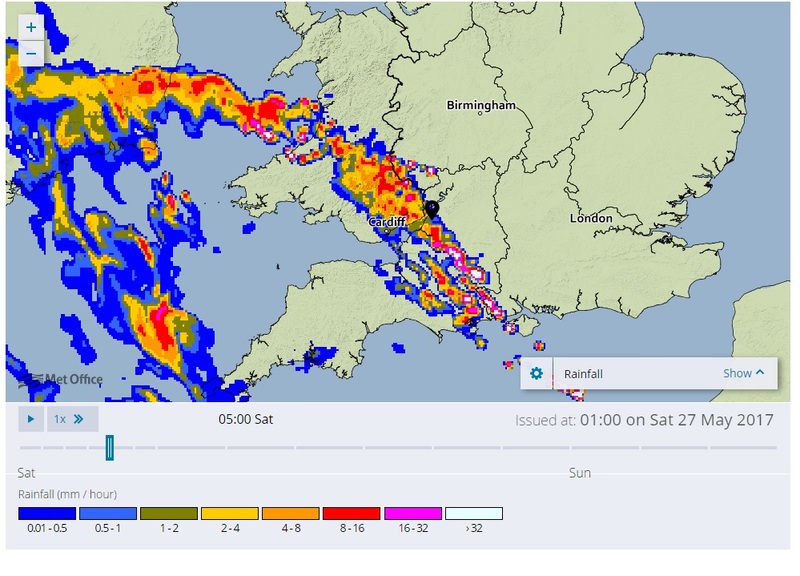 That Meto rainfall grab looks nice for a 5am wake up call here in Cirencester! good luck all - keep the faith! Oooo i like this looks good given whats already happened in cornwall! Great stuff here. Seem to have a new cell with lightning to my east in addition to the beasty display to my north east now. Great stuff here. Seem to have a new cell with lightning to my east in additional to the beasty display to my north east now. If everything keeps moving in the direction it is at the moment then anything I get here would head straight for you.